What’s the difference between an artwork and a design? The worst insult you can give to a work of art is to ignore it. The worse thing you can do to a design is to treat it as a work of art — i.e. not to use it. This is an argument advanced by philosopher Nicholas Davey on the difference between art and design, from a hermeneutical perspective. Artworks require us to linger over the work itself — stare at the painting, admire the sculpture, enjoy the music. But when designed objects (spoon, spanner, chair) function as they are supposed to they disappear, drawing attention rather to the task at hand (to eat, mend or sit). “In order for the artwork to operate hermeneutically, it has to command attention. The properties of diversion and distraction are, however, potentially disastrous for a piece of equipment” (46). This is a potent starting point for thinking about design, especially if we take on board “the dynamic of appearance and disappearance, of how their visible qualities must connive to attract a user to a task whilst not distracting from that task” (46). In an earlier article on design and hermeneutics Adrian Snodgrass and I were less interested in the difference between art and design — a distinction about which architects are uneasy when talking about buildings. As educators we were more interested in the processes of design. After much reading and reflection on hermeneutical theories, Adrian picked up on the insight of Donald Schön in common circulation in the 1980s-90s. Schön spoke of design as “reflection-in-action,” where design is “a reflective conversation with the situation” (78). Adrian thought (and I concurred) that what Schön describes here is a clear and straightforward account of the working of the hermeneutical circle as summarized by philosopher Richard Bernstein: “a continuous dialectical tacking between local detail and global structures … a sort of intellectual perpetual motion” (95). In hermeneutical terms designers proceed by way of a continuing inter-referencing of a projected whole and the particulars that make up the design situation; designers project the meaning of the whole and work out the implications of this projection by referring it back to the individual parts, which are then reinterpreted. Design creation and understanding arises by a process of constant revisions. These insights support the view that to design is to interpret. One side benefit of this theory is that it conflates the process of using and that of making. I like the idea that the making of an artwork or design doesn’t end when it leaves the studio or the production line, and that visitors to a gallery, an online digital artwork or a building are complicit in its making. Also see blog post Poiēsis. 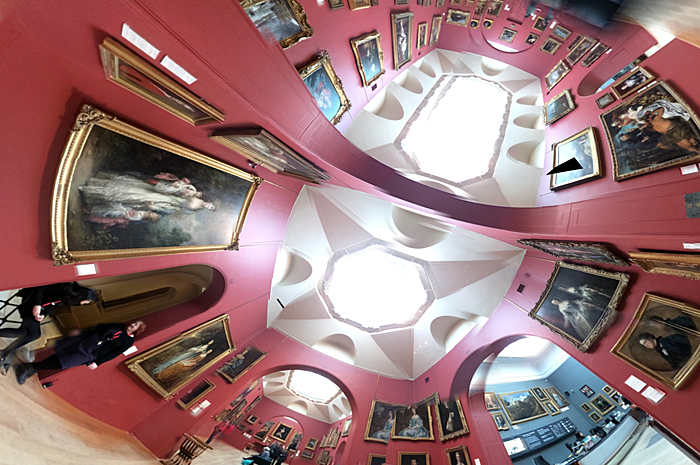 The image is of the Dulwich Picture Gallery, London, by John Soane. Davey, Nocholas. 2012. Hermeneutic reasoning, aesthetics, and the question of design. In M. L. Portocarrero, L. A. Umbelino, and A. Wiercinski (eds. ), Hermeneutic Rationality: 43-50. Berlin: Lit Verlag Dr W Hopf. Snodgrass, Adrian B., and Richard D. Coyne. 1997. Is designing hermeneutical? Architectural Theory Review, (2) 1, 65-97. « What have the arts to do with ethics?